Menulog delivers for Seoul & Ko so you'll be able to track your courier on a map. Cold noodles with chilled beef broth soup. Slow cooked chicken bone soup with herbs and spices stuffed with sweet rice. Traditional stew that army soldiers ate during the Korean War, an assortment of vegetables, Vienna sausage, ham, tofu, baked beans and rice cakes in a kimchi broth. Served with two bowls of rice. Stewed whole chicken, potato, carrot, soy sauce based marinade with glass noodles. Served with two bowls of rice. Trio includes serve of rice. Popular in the 1900's this lunch box is iconic in South Korea. Containing rice, mini sausages, a sauteed vegetable, fried kimchi topped with a fried egg. Steamed rice with assorted vegetables with the choice beef or pork. Kimchi and pork fried rice with vegetables topped with a fried egg. Marinated spicy pork with assorted vegetables served on a hot iron plate with rice. 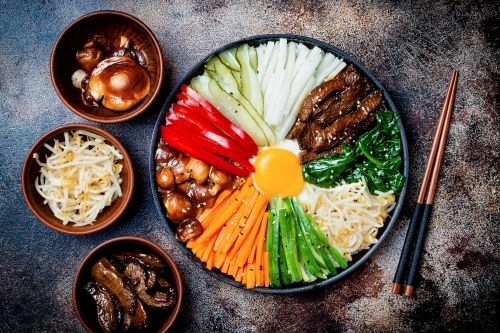 Marinated bulgogi beef with assorted vegetables served on a hot iron plate with rice. Iconic Shin ramen cooked Korean style with onions, rice cakes and egg, spring onion. Stir fried glass noodles (sweet potato noodles) with assorted vegetables in a homemade soy sauce. 3 pieces of fish cake sticks with soup. Spicy rice cake with fish cakes, onions and shallots. Assorted vegetables with protein with sesame flavoured rice. Fresh cut boneless chicken fried, served with sweet chilli sauce. Keri, contains 99.9% orange juice and vitamin c.
Keri, contains 99.9% apple juice and vitamin c.